A 2013 study by the RAND Corp. concluded that for every one dollar invested in carceral education, five dollars was returned in the form of cost of prison savings. Speaking on the results of the study, author Lois Davis said, "We are at the point where the debate no longer should be about whether or not prison education is effective." A 500 % return on investment clearly establishes that prison education works, from an economic perspective. But there is more to the question of prisoner education than basic economic analysis. Education and literacy are essential elements of a properly functioning democracy. Whether we withhold or offer them to prisoners of the state says something about us. As Bard Prison Initiative teacher Ellen Condliffe Lagemann puts it, "Prisons diminish human capital. Investments in education increase it." 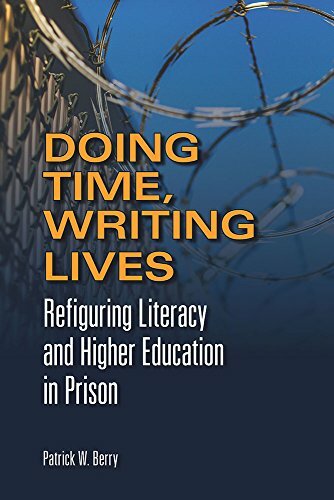 Professor and prison educator Patrick W. Berry takes a close look at higher-level carceral education in his new book, Doing Time, Writing Lives: Refiguring Literacy and Higher Education in Prison. Through his own experiences as a teacher with Project Justice, a college-in-prison program in the Midwest, as well as the experiences of prisoner-students and fellow teachers, Berry explores a central question in the prison education context: What can literacy really do? For one thing, literacy reduces recidivism. Carceral education also improves post-release employability. These are both high-level goals of criminal justice policymakers. But Berry argues that while reducing recidivism and increasing the employability of ex-offenders are important, they should not be where the evaluation of the value of education and literacy in prison ends. "Questions are often raised about recidivism rates and whether literacy (or higher education) has rehabilitated an incarcerated student and prepared him or her for release," writes Berry. "The answers are important but not sufficient as overall assessments of the effectiveness of higher education in prison." Berry also cautions against the idea that literacy and education, by themselves, are "magical actor[s] capable of transcending social, material, and economic problems." Too much emphasis on the undeniably transformative power of literacy, at the expense of larger social and cultural factors that impact those involved in the criminal justice system, can and does lead to misapprehension of the nature of the criminal justice problem. But literacy in this context matters, at both the macro and micro levels. Berry considers how by attending to what he calls the "contextual now" of the literate individual. This refers to "those acts of composing and becoming that lead to deeper engagement with the world and one's place in it" as well as "the value of being present." This sounds more complicated than it actually is; Berry convincingly argues that literacy in the present moment—even for a prisoner, or maybe especially for a prisoner—is "valuable in its own right." The value exists in the narratives that arise in the literacy setting. For prisoners, such narratives include escape from their dismal and oppressive surroundings. An educated and literate prisoner can create a contextual now in which they read and write their way out of the prison. The narratives that can exist for the literate prisoner in the contextual now can also be quite practical. Berry illustrates by highlighting the work done by his prisoner-students to research the provision of education in prison. The research led to effective business proposals that were presented at an organized symposium on higher education in prison. One of the proposals was adopted by the prison. Berry makes a powerful argument for the importance of education and literacy in prison. What sets his work apart from most other prisoner education advocates is exactly what makes the argument so strong. Yes, the education of prisoners reduces recidivism. No, education is not a panacea that will solve the problem of crime. But neither of these should be what drives a strong push to educate prisoners. Instead, education and literacy should be provided to every prisoner because doing so is the right thing. "Providing education and literacy is an ethical imperative and a valuable way to support incarcerated individuals as they work to make sense of their lives," writes Berry. "Even when an economic payoff is not instantly visible and, indeed, may never come to light, such support can be useful in shaping how an incarcerated person comes to see himself or herself and his or her potential." For those seeking to better understand what literacy and education can do in the prison context, Doing Time, Writing Lives is a must-read. Berry's perspective, that of the boots-on-the-ground prison educator, combined with his refusal to focus on what we already know (education reduces recidivism), makes this a uniquely valuable addition to the scholarship on prison education.